Reebok ZR8 Electronic Cross Trainer. 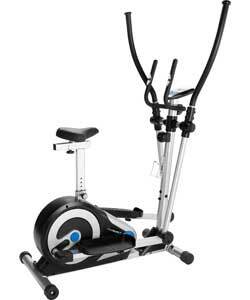 The ZR8 Electronic Cross Trainer offers an ultra-smooth motion. With 32 levels of resistance, all easily controlled via the sleek LCD console, your workout has never been so intuitive. The backlit display enables you to monitor your time, distance, heart rate or see how close you are to burning your target number of calories. Number of programmes: 12 x pre-set, 4 x target, Watts control, user, recovery. Console feedback including: Speed, time, distance, calories, pulse.